The possible patchwork patterns for your custom quilt number in the double digits. This is also what you will always see when you gaze upon your custom made Amish quilt when it is covering your bed. For this reason, you need to make this decision after knowing all the possibilities that are available to you. 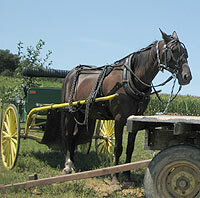 Many of these patterns are the same ones used by many Amish families for many generations. They have been passed down through the ages, and are now available to you and your family. One of the most popular and distinctly Amish is the Central Diamond design. This goes by many other names including the Lone Star and the Star of Bethlehem. This centralized star pattern can also be incorporated into other arrangements, like when it is the focal point of the quilt but the remainder of the quilt top is of the log cabin design. This mixing and matching of two different designs is common, but has to be requested by you. The log cabin design is one that is a little misleading. This does not have a picture of a log cabin on it. It simply meant that the design was common in log cabins 150 years ago. This is a series of squares placed on the quilt in a repeating pattern. Within the squares, repeating colors are used to create a unique pattern to them. On occasion, there can be another color overlaid on them to give the impression of the quilt cover having a see through effect with other colors placed below. This is an optical illusion that is somewhat mesmerizing. The cabin Trellis Patchwork quilt is one that will use different shades of the same color to give a unique pattern to the quilt top. The use of blues or reds is the most common. Again, the main theme of the quilt top has squares set on their ends so they look like diamonds. Another very popular variation to the log cabin is the fan design. This is where fan shapes are introduced instead of the traditional squares of the log cabin. In most instances, the fans are of multi colors and make the appearance of the quilt top special. Most are one of a kind because each pattern is done by hand and is hard to reproduce exactly on a repeating basis. The Double wedding rings quilt top is one that places two different colors of rings which interlock with each other. This is intended for a couple’s bed and will represent the unity of the couple that sleeps below it. To help make the pattern of the rings to stand out more, most of these custom made Amish quilts have a white background to them. 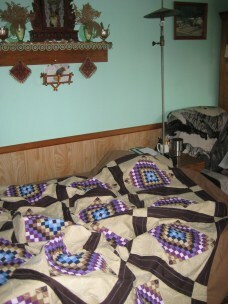 Two types of patchwork Amish quilts patterns that are similar, but still different, in their own perspective are the Earthquake and Escalating quilts. The earthquake patchwork quilts use earth tones that are set in a waving pattern across the quilt top. The Escalating quilt is using a mix and match of other colors that still give you the vision that the quilt is moving. The Around the World pattern of patchwork quilts start with a small diamond shape in the center and begins to expand. Each new layer of small diamonds is a different color and creates a vivid and colorful pattern to adorn your bed. These are just a few of the many different types of custom made patchwork Amish quilts you can have for your bed. The choices are many so look at all of the selections before deciding on the one that is right for your home.